Argentina are confronting the possibility of an early World Cup exit after a ghastly blunder from goalkeeper Willy Caballero set Croatia on their approach to triumph and a place in the last 16. On a night when so much was anticipated from Argentina skipper Lionel Messi, Caballero made the most advising commitment to his group's destiny with an endeavored chip over Ante Rebic that reverse discharges gravely, enabling the striker to volley into an uncovered net in the 53rd minute. Messi -- adrift for much of the match, especially during a pedestrian opening half - helped to rally his side after going behind, but neither he nor substitute forwards Gonzalo Higuain and Pablo Dybala could find a way through. The nearest Messi came was a half-possibility, a grab at a bounce back from a Maximiliano Meza shot which was obstructed by Danijel Subasic and swung behind to wellbeing. It was a resolute guarded second-half display from Croatia, enlightened by a snapshot of enchantment from their own breathtaking number 10, Luka Modric. His twisted shot from go floated perfectly past Caballero's gloves to put his side two ahead, before Ivan Rakitic's damage time tap-in fixed a triumph that moves the Europeans through to the knockout stage and furthermore abandons them in a solid position to win the gathering. For Argentina, they are never again responsible for their own predetermination. 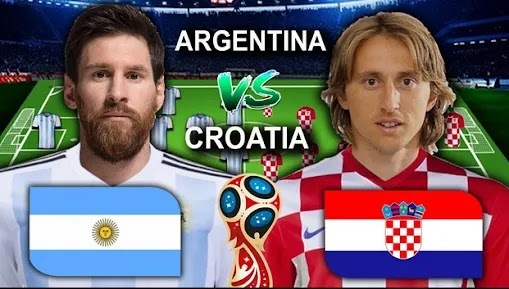 This annihilation takes after their opening 1-1 draw with Iceland, in which Messi missed a punishment, and now even an overwhelming win over Nigeria in their last diversion on Tuesday may not be sufficient to send them through to the following round. Should Iceland beat Nigeria in their second gathering diversion on Friday, Iceland would require just an attract against Croatia their last match. This was Croatia's first victory in five attempts against a South American team at the World Cup, having lost the previous four. This was Argentina's heaviest defeat in the first-round group stage of a World Cup since losing 6-1 to Czechoslovakia in 1958. This was Croatia's joint second biggest World Cup victory; they beat Cameroon 4-0 in 2014 and Germany 3-0 in 1998. Ante Rebic's goal was his second for Croatia, and his first since August 2013 in a friendly against Liechtenstein. Two of Luka Modric's four goals in major tournaments for Croatia (Euros and World Cup) have been from outside the box. Argentina's Lionel Messi, who had 11 shots in the opening game against Iceland, did not manage a single attempt in goal until the 64th minute.